Aaron Judge in the batting cage earlier this season. Photo by Jason Schott. 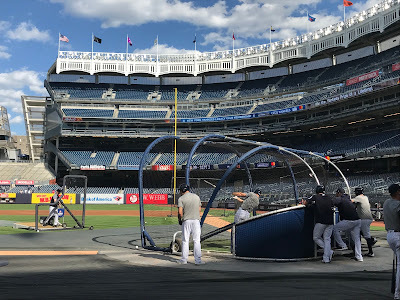 Monday was an off day for the Yankees ahead of the start of their three-game series with the Boston Red Sox, but they received some good news on two of their key players, right fielder Aaron Judge and closer Aroldis Chapman, returning for the stretch run. 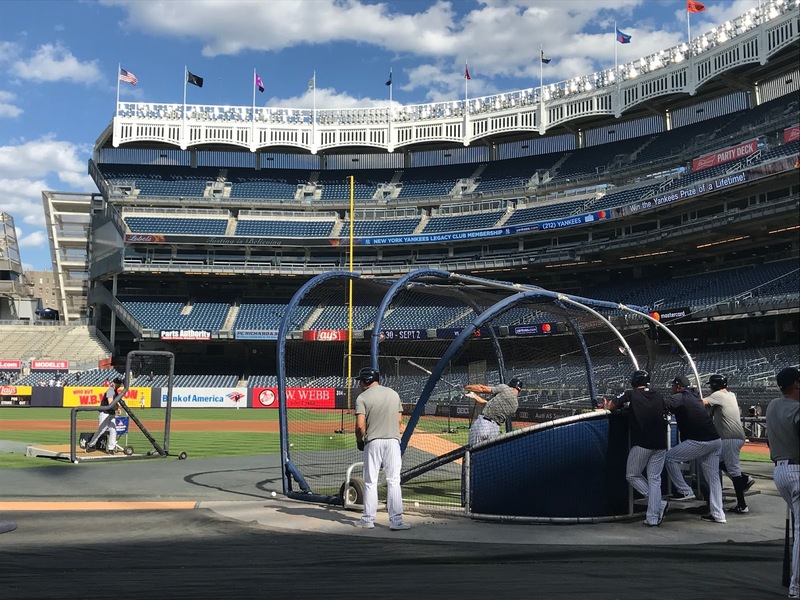 In a simulated game at Yankee Stadium, Judge had 11 live at-bats off of RHP A.J. Cole, RHP Chance Adams and minor-league LHP Phillip Diehl. Additionally, Chapman threw 22 pitches to Tyler Wade and Kyle Higashioka. Both Judge and Chapman completed their sim-game programs without issues. Judge is hitting .285 with 26 home runs and 61 RBI in 100 games. He has been out with a wrist injury suffered when he got hit by a pitch against Kansas City on July 26. Judge was activated from the disabled list on Friday, and he entered that night's game in the eighth inning. He played two innings in right field, but did not take an at-bat in an 11-0 Yankees win. He did not play either Saturday or Sunday, both of which were losses to Toronto. Chapman, who has 31 saves with a 3-0 record and 2.11 ERA, was placed on the DL on August 22 when he was diagnosed with a flare-up of tendinitis in his left knee. The Yankees have struggled with both of them out of the lineup, as the offense has not been able to pick up the slack without Judge in there, and Dellin Betances has had issues filling in for Chapman in the closer's role, including a blown save on Sunday against Toronto in a 3-2 Yankees loss. The Yankees are on the verge of losing the American League East to the Red Sox, whose magic number is two, but having Judge and Chapman possibly back for the wild-card game will give them a boost at just the right time.